Taking into account price, location and room quality, the Dan Panorama Tel Aviv is one of my favorite Tel Aviv beach hotels. You get good value for your money if you’re looking for a large, full service hotel, rather than a more intimate boutique hotel. Both the Dan Panorama and the more upscale Dan Tel Aviv Hotel a bit further north along the beach belong to the excellent Dan Israel hotel chain. I would definitely recommend staying at any of the Dan Hotels in Israel, in Herzliya (Dan Acadia), Dan Eilat and Dan Haifa. 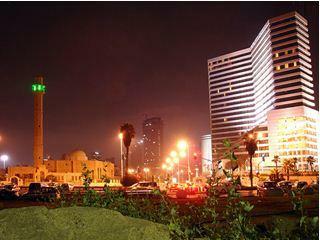 The Dan Panorama Hotel is just across the street from the sea and the Tel Aviv boardwalk. You can walk a few minutes south or north to hit on of the great Tel Aviv beaches. Day or night, just step out and you'll find something fun to do. If you walk south along the boardwalk , you’ll hit old Jaffa in 15-20 minutes. Head north along the beach strip until you reach the lively Tel Aviv port area for shopping, restaurants, clubs, and more. Or try biking along the promenade – it is loads of fun. East, right behind the hotel is Neve Tzedek, one of Tel Aviv’s oldest and coolest neighborhoods. Visit our page on Tel Aviv's unique streets and neighborhoods for more about Neve Tzedek and other Tel Aviv neighborhoods worth visiting. Or go to the Tachana – the renovated old train station just nearby. Also minutes away are some of the city’s colorful markets that are a must-see, the Carmel market, the Levinsky spice market and the Flea (hapishpishim) markets. Find out more about browsing in these markets and other ideal places to buy gifts or souvenirs in our page, Tel Aviv Shopping. Although it’s not a true 5-star hotel, the standard rooms, called “deluxe rooms”, are comfortable, modern and well-sized. All the rooms have a balcony which is a nice treat. If possible, ask for a higher floor when reserving your room. 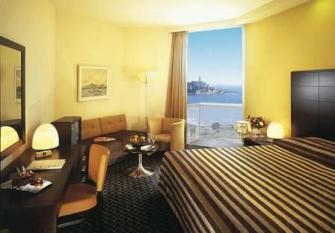 The slightly more expensive executive rooms are on the 15th to 18th floors with a stunning Mediterranean sea view. I don't think, personally, there is a huge difference between the deluxe and executive rooms, but one of the nice perks for 'executive' guests is the executive lounge which provides free refreshments such as fruit, pastries and drinks all day long. The outdoor swimming pool is one of the largest and loveliest in Tel Aviv hotels with pools. Just note that it is closed between November to April. Besides the lovely pool, the Dan Panorama Tel Aviv breakfast truly surpasses typical Tel Aviv hotel breakfasts. Expect an excellent selection of breads, pastries, cheeses, salads, fish, freshly made omelets and waffles too! Included in the bed and breakfast fee is freshly made coffee - filter, espresso, cappuccino and latte. What a nice way to start the morning. And finally, wifi is free throughout the hotel! Tel Aviv Hotels 4 and 5 star hotels are not cheap. 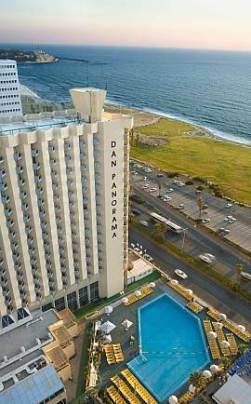 The Dan Panorama Tel Aviv is an excellent option if you are looking for a relatively reasonable price for a first class hotel, without compromising on comfort, location and service.